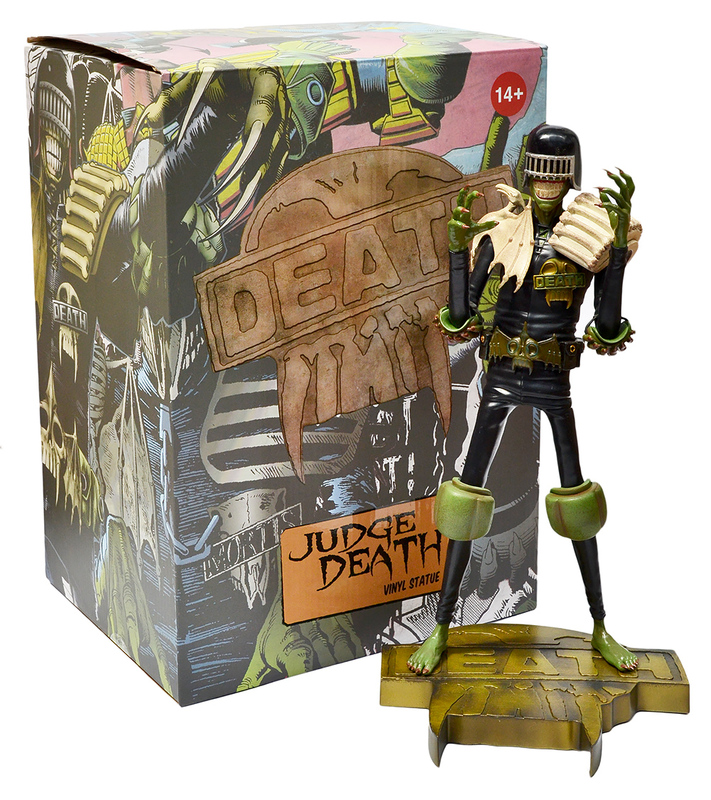 Reviewed: Judge Death Statue (Unbox Industries, 2018) | 'TAIN'T THE MEAT… IT'S THE HUMANITY! 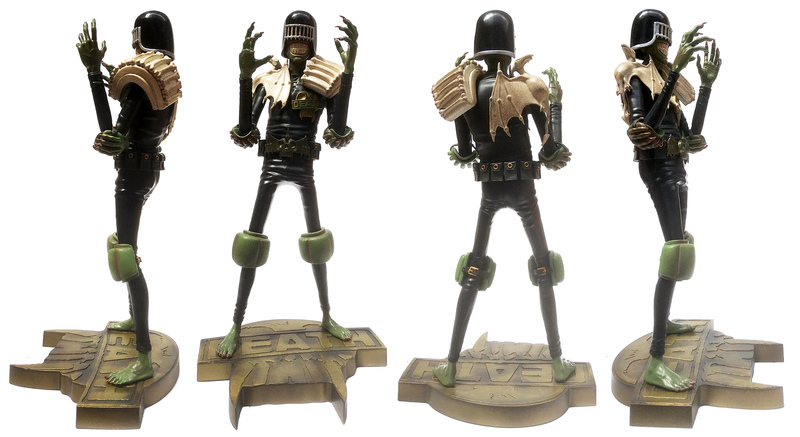 Fresh from vinyl toy maker Unbox Industries comes this superb statue featuring future lawman Judge Dredd‘s arch nemesis, Judge Death! Just under two years ago Hong Kong based Unbox Industries scored a hit with their superb Judge Dredd Artist Edition Statue, based on the artwork of famed 2000AD artist Mick McMahon. For their second 2000AD entry Unbox have released a statue featuring the evil Judge Death, based on the first artist to interpret the character: Brian Bolland. Judge Death first appeared to hound Judge Dredd in Prog #149 (26 January 1980) of weekly British science-fiction comic 2000AD. The dimension-hopping Judge Death believes that since all crime is committed by the living then crime can only be abolished by killing the living, and along with three other Dark Judges (Fire, Fear and Mortis), does his damned best to fulfil that judgment. This twisted version of Dredd proved an instant hit with readers and the character has returned many times over the last four decades to torment the future lawman. Released in January 2018 this Judge Death statue is made from painted vinyl and measures an impressive 13 inches in height (when placed on its one inch stand). The statue comes in one piece and ships in a sturdy cardboard box adorned with some of Bolland’s most iconic Judge Death artwork. 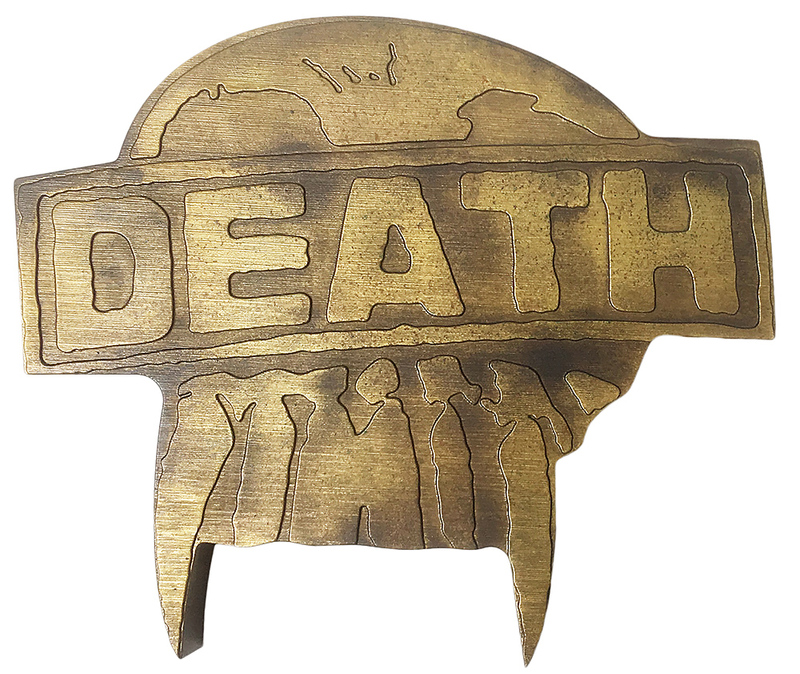 Also included is a gold base in the shape of Death‘s badge; like the Dredd statue the base is magnetic and keeps Death standing tall (a nice touch). Unbox Industrious have done a fine job interpreting Bolland’s artwork — the attention to detail is very high indeed. Death‘s teeth; his shoulder pads and the claws on his elbow pads are all lovingly recreated. 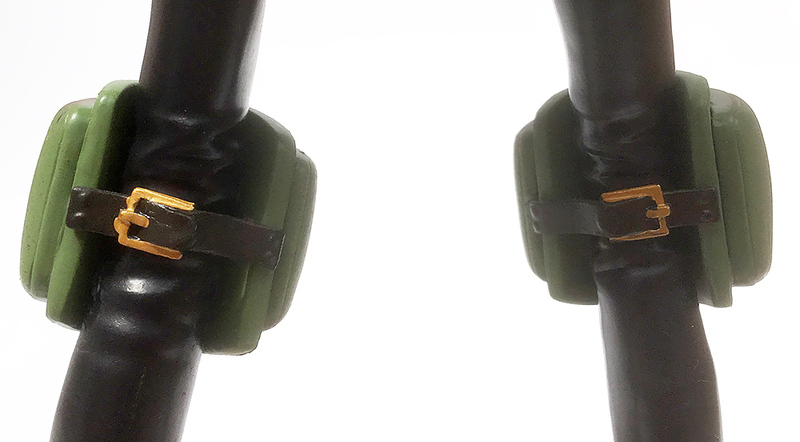 Even the buckles on the back of his knee pads are shown. The level of detail on this statue is very impressive. Detail aside, it’s the paintwork on this statue that really makes it sing. The colour shading on Death‘s pterodactyl shoulder pad, his sickly green skin as well as his knee pads are all masterfully done. All told this is a terrific statue. Love the paintwork on Death’s shoulder pad pterodactyl. The Judge Death Statue RRP’s for $85 (£64), and at the moment Unbox are offering free shipping, which currently makes ordering direct from them the cheapest option for those wishing to buy the statue. Unbox deliver quickly too — mine arrived within eight days of ordering (and very well packaged it was too). The Judge Death statue, from all sides. 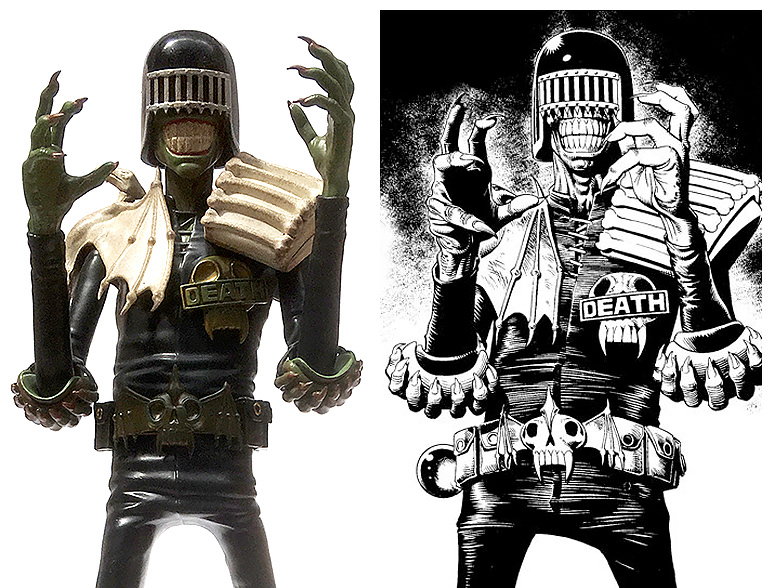 One of my comments when I reviewed the Judge Dredd Statue was that is didn’t really look that much like Mick McMahon’s artwork. I love McMahon’s stint on Dredd from the late ’70s and early ’80s but if I hadn’t been told in advance that the statue was based on his work I never would have guessed. I had no such trouble with this Judge Death statue however. It’s clearly based on Bolland’s artwork and it’s terrific seeing one of Dredd‘s greatest foes — as interpreted by one of his greatest artists — realised in such dramatic fashion. On the right is Bolland’s artwork on which the statue is based (from Prog #226, 22 August 1981). 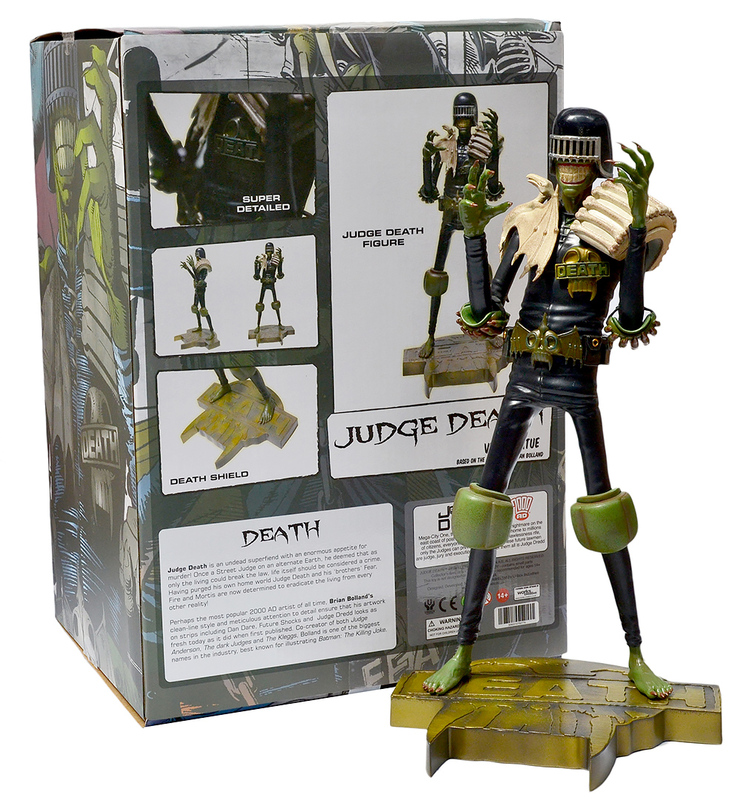 For any fan of 2000AD and Judge Dredd this excellent Judge Death statue is a must, and priced at just over £60 it’s also a bargain. Unbox have done a great job (yet again) and I for one am hoping their foray into interpreting classic 2000AD characters doesn’t stop here. 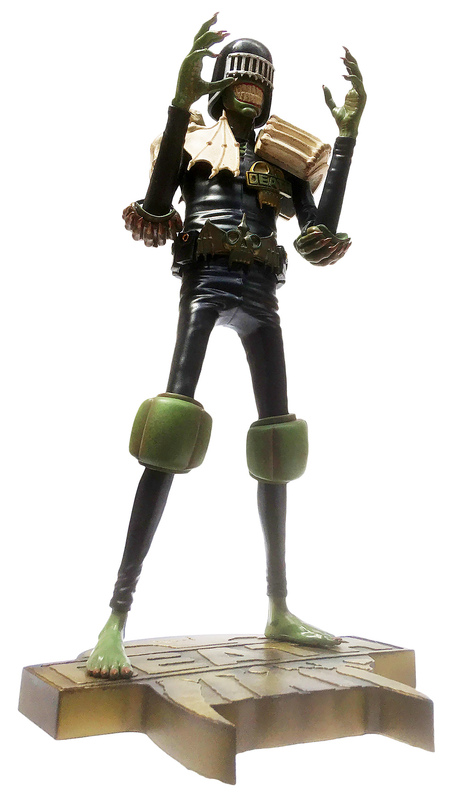 Come on Unbox, how about a Johnny Alpha, Strontium Dog, statue based on Carlos Ezquerra’s artwork? Or Kevin O’Neill’s Nemesis The Warlock? It’s not like there aren’t plenty of great 2000AD characters — and great artists — to choice from. More please!